The Tour Down Under is a UCI World Tour Event. So far as I can tell, the traditional kick-starter around the streets of Adelaide, the 50km People’s Choice Classic, is not. A super exciting and super fast criterium, it sees the first clash in anger between WorldTour teams each year. It’s quite a spectacle for the fans, but as the voice of cycling himself Phil Liggett mentioned last night, it’s no more than an “hors d’oeuvre” – it contributes precisely nothing to the Tour Down Under standings and, therefore, as I watched the riders fly around the 2km street circuit last night I couldn’t help but think it must be a top rider’s worst nightmare. Not much to gain. But a whole lot to lose. Imagine if Cadel Evans, a reluctant early-season starter at the best of times, came down with a silly touch of wheels at the beginning of such a pivotal year in what is essentially an exhibition race. It could have spelt the end of his career. Whilst perhaps not career-ending, the impact of a serious injury to Richie Porte last night could also have been significant, given his confirmed release from super domestique duties to pursue personal ambitions for Team Sky at the Giro in May; a career-defining opportunity for the hugely likeable Tasmanian. 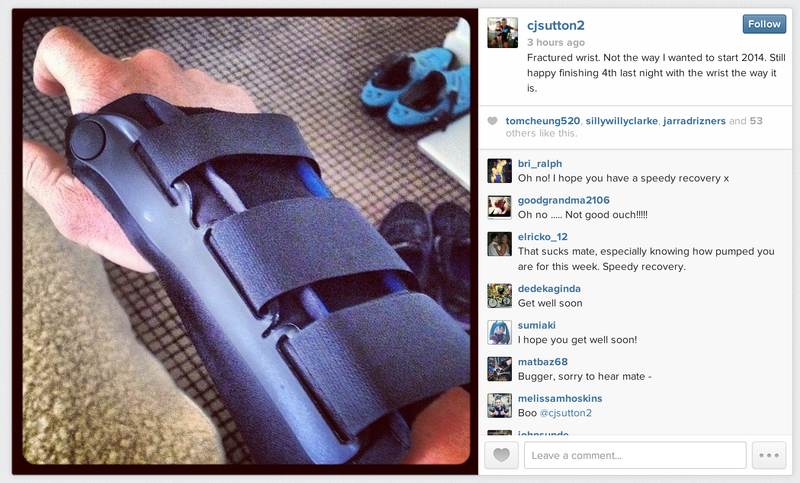 CJ Sutton fractured his wrist in a crash, before recovering to finish 4th last night. It remains to be seen what impact the injury will have on his upcoming races. He’s already been ruled out of the TDU, replaced by countryman Nathan Earle. In last night’s edition, won by the flying Dolph Lundgren impersonator and 2013 TdF star, Marcel Kittel, ahead of his German countryman Andre Greipel and rising Aussie U23 star Caleb Ewan, the entertainment factor was undeniable. But as is not uncommon for criteriums at any level, there were sketchy moments aplenty in the 130+ strong field, and several injuries from the resulting – and virtually inevitable – crashes. 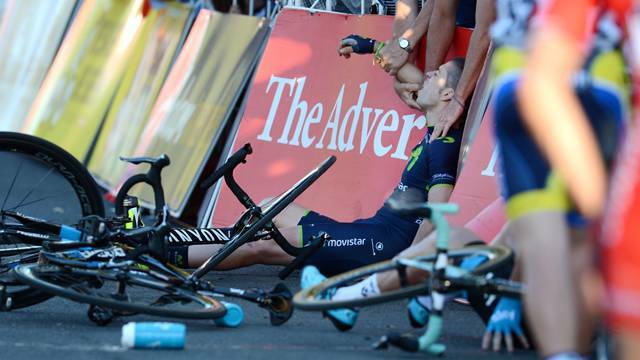 Team Sky’s Australian sprinter CJ Sutton broke his wrist (he still finished 4th) whilst Movistar’s Italian star, Giovanni Visconti, suffered a compound fracture of his tibia amidst a large pile-up on lap 7 – a terrible injury that, no doubt, now wreaks havoc on his team’s plans for the 2014 season. All less than 48 hours from the start of it. Not how the former Italian National Champion, Giovanni Visconti, wanted to start 2014. Of course, cycling will always have its dangers (just ask Thomas Voeckler who lasted less than 24 hours in one piece in Adelaide). Despite best laid plans no amount of protection from your team-mates can prevent every incident in a race. But as a professional rider, surely if you’re going to risk injury and the myriad ramifications should it befall you at the very start of the new season, it should be in a race that means something tangible for you and your team? And, no, I don’t just mean a few thousand Euros in prize money. I’m not saying get rid of the People’s Choice Classic. Far from it. Rather, why can’t it be made an official part of the UCI Tour Down Under proper as a genuinely meaningful, points-accruing stage with time gaps and/or time bonuses? Crashes will still happen. But at least when they do, it won’t have been entirely in vain.